When it comes to diversifying his brand, 50 Cent is no slouch. Though his star no longer shines nearly as brightly as it once did, he keeps pushing boldly into new territory. Now, he’s looking to conquer yet another medium: comic books. That would seem to be an easy fit given his larger than life persona and superhero physique. However, his first venture into the world of primary colors will not be the usual capes and tights fare. Instead, it will be an adaptation of 50’s 2009 novel with Robert Greene, The 50th Law. The comic will be published by SmartComics, a company that seeks to put out “comic-textbook hybrid[s] in hopes to inspire and reveal keys to success to business leaders and innovators without boring amounts of text.” That’s quite an ambitious vision, to say the least. The book will also feature illustrations by artist Dave Crosland. Amazon has just revealed the cover art. It will be interesting to see how this whole endeavor pans out. 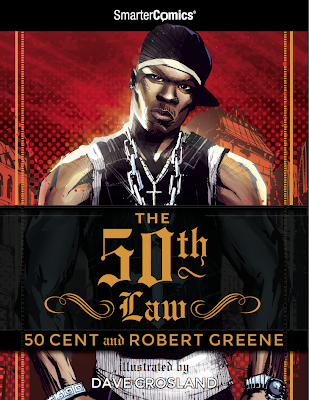 The 50th Law is a strategic tome for the business world. It doesn’t really tell a story, though it does contain a number of anecdotes. I can’t imagine how something like that could be translated into 60 pages of sequential artwork. If this were an adaptation of 50’s autobiography, From Pieces to Weight: Once upon a Time in Southside Queens, it would be easier to envision. Either way, the book willbe released on October 10th and is now available for preorder. 50 Cent has just released the trailer via his YouTube channel, which I have embedded below.